This raw pu erh tea cake is produced by Liming Tea Factory under its Ba Jiao Ting (aka 8 sided pagoda) logo. The date stamp on the wrapper is blurry but I think I could make out the year as 2007. Although Liming tea factory is an established and well known tea factory, their tea remained 'under the radar' and the prices of their tea are less pricey than the more famous brands. Collectors that invest in Chinese pu erh tea would normally purchase the bigger brands or special limited edition cakes to store long term. However, in the latest Tea Art Magazine issue #61, Liming tea factory took out an advertisement on their new Lao Ban Zhang tea cake (last pix). I remember I had walked pass their distributor in Guangzhou and I will visit them to find out more about their new tea cake. I hope not to lose an arm or limb when I buy this tea. Back to the 2007 Ba Jiao Ting cake. This 10 year old cake brews up a nice clean and strong tea. I noticed this tea cake is highly compressed and you need your tea tools to pry open the cake. This tea is clean with a pleasant amber color in the drink. Nothing extraordinary but I enjoyed the herbal / medicinal aroma and slightly sweet aftertaste. I realised I had brewed this tea 3 days in a row. A happy purchase. I was in Hong Kong last year and I wanted to brew a late night tea in my hotel room. The Xiaguan sales manager recommended me to buy this ripe tuo, telling me that this 2015 pu erh tea was actually much older and that Xiaguan had produced this tea 2 years earlier and had stored the tea away before releasing this tea in 2015. I had noticed that the bigger pu erh tea factories like Xiaguan, Taetea and even Haiwan are actually 'storing away' pu erh tea (the finished product) and releasing this tea after a few years of storage. This applies to both raw and ripe pu erh tea. This makes a lot of sense. As a pu erh tea drinker, you will attest that newly produced pu erh tea is a bit rough and astringent especially for raw pu erh. You can also detect a fermentation smell in newly made ripe pu erh tea as well. If you had stored away these new pu erh tea away for 3-5 years, you will discover that the tea is much easier to drink. The aroma and taste is more smooth and mellow. I think in this age, people demand 'instant gratification' when they buy and consume goods and services. It will be tough to sell/buy a product knowing the product is better 3-5 years down the road. I suppose these pu erh tea factories are making their new pu erh products a ready to brew/drink tea. In a way it is like buying older pu erh tea. Back to this 2015 Xiaguan tea. I actually did not brew this tea when I had returned to my Hong Kong hotel room. I had went for late supper instead. I only opened this tea last week. This tea, to me, is still young, but I enjoyed the strong aroma and taste of this ripe tea. This tea would be a good candidate for aging for another 8-10 years. These tea ware in the pictures are made in Singapore. 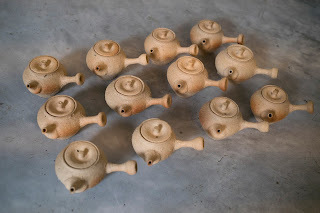 They are not only made in Singapore but the clay also comes from Singapore. The potter is Kim Whye Kee. Kim was involved in bad company during his younger days and was incarcerated when he was 18 years old. He picked up pottery making while in prison and his passion for this craft intensified when he was released. 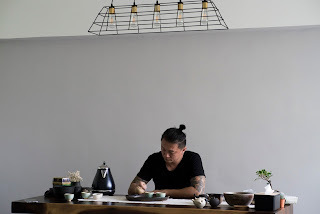 He took up a full time course in pottery, graduated with a degree in fine arts in 2013, and now is a proprietor of Qi Pottery. He owns a small electric klin in his apartment to create his own works and hold small classes for the public to learn pottery. "One collaborative work on display was a mixed-media installation titled Family Dinner. It was created by the exhibition's artist-in-residence and potter Kim Whye Kee and 10 inmates from the Visual Arts Hub at the Changi Prison Complex. The piece was inspired by an inmate's experience behind bars, and depicts his longing for a simple family dinner. "Every inmate hopes to go home to his family. It was usually the first thought I would have when the handcuffs were around my hands," said the 36-year-old Kim, who went in and out of jail for about a decade after getting involved in gangs and drugs from the age of 18. "I dreamt of going home for a simple meal with my father. But six months before I was released, he passed away from cancer. It was too late," he said. 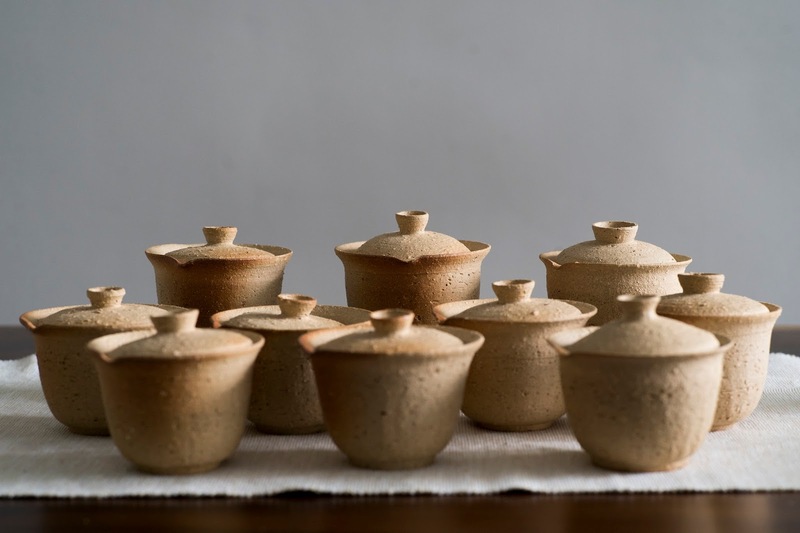 After his father's death in 2007, Mr Kim picked up pottery in prison, which gave him the peace and motivation he needed following his father's death. In the installation, which he has dedicated to his parents and sister, he placed a lone chair facing three cracked rice bowls on a dining table. Each bowl was carved with messages that could be seen only through their reflections on the table. "It's like a person sitting there, thinking about what to say to his family during dinner," he said. "Sometimes, we feel pai seh (Hokkien for embarrassed) and the words just don't come out." Also featured were 14 other ceramic bowls which were smashed and mended back together. "I put the pieces back together using clay and gold paint. I wanted to show the inmates that even though they've made mistakes, their family and the community will always offer them a second chance," he said. Three years ago, Mr Kim, who was released in 2008, graduated with a degree in fine arts from Lasalle College of the Arts with the support of his mother, who worked as a cleaner, as well as his sister and the Yellow Ribbon Project. Mr Kim now runs pottery workshops in his own studio." "This clay is quite rough to work and instead of burnishing it, I decided to keep the characteristics of this clay, staying true to its look and feel. No glaze for this ware but if you look carefully, the body is slightly flushed and each pot will be unique"
I purchased one of the kyusu teapot and the 4th pix showed the teapot photographed under yellow lighting while the other 2 pix below were taken under natural lighting. If any reader is interested to know more about Kim and and his works, you may visit his website (link) to get more details. I wish Mr Kim the very best in his pottery business.